I'm lucky enough to live in a neighborhood where there are at least two incredibly delicious pizza joints within short-walking distance from my house. The first is the perfectly quirky, always imaginative Classic Slice, whose slices are the size of an infant. The second is the more quaint, traditional Mama De Marini's, whose sausage pizza may be one of the best I've ever had. As someone who absolutely adores pizza, I'm a lucky girl to have two wonderful establishments within such close proximity to my own front door. Also as someone who adores pizza, I'm not a lucky girl in the sense that I was not blessed with a naturally speedy metabolism. If I were to frequent these two joints as much as I'd like to, I'd turn into a little dough ball, myself. So when I've got a hankering for some pizza, I like to have a healthier version to hold me over until I decide it's time to treat myself to the real, cheese-smothered, doughy deal. This version is for those who are more carb-conscious. I'll admit, I am crazy for carbs, but they're not crazy for me. While I don't believe in cutting out certain foods completely from my diet, I do know I need to limit my carb intake if I'm trying to lose a couple pounds. I don't have a problem with this if I can find a decent, lower-carb substitute for my favorite treats. And in this case, I think I've found a great one! You've got to approach this pizza without the expectation of its tasting exactly like your favorite delivery... or even frozen variety. Pre-bake, the dough is much more sticky than its flour-based counterpart. There's no flipping and spinning this dough. You'll need to spread it and shape it on a stick-free surface (I used a silicone sheet liner) with your hands. But after a little pre-baking, then baking again with your choice of toppings (we used mushrooms, onion and red peppers), it's firm and thick and sturdy enough to eat with your hands (no fork necessary!). The crust ends up chewy, thick, dense and a perfect vessel for your favorite toppings. Perfect for those of you who have a gluten intolerance or (if you cut out the cheese) are following the Paleo diet! 2. Mix all ingredients in a large mixing bowl until it begins to form a dough ball. 3. Line a baking sheet with a silicone mat or coat with cooking spray. This is VERY important if you want your pizza slices to come off in one piece. 4. Press your dough on the sheet with your hands so it's just about 1/4 of an inch thick. 5. Put crust in the oven for about 15 minutes until edges are golden brown. 6. Top with your choice of pizza sauce and toppings, and bake again another 15 minutes or until cheese is golden. 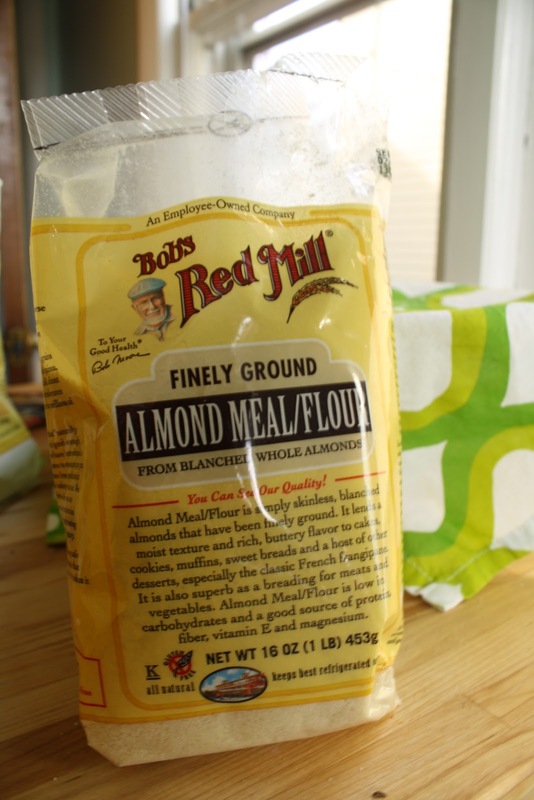 Interesting to use almond flour. Nice idea!